A high-tech formulation to shield skin from the primary factors of premature ageing. 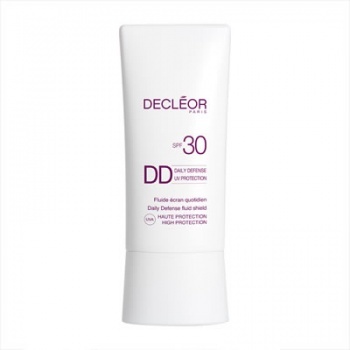 Providing double the defence, Decleor have developed the innovative Daily Defence Fluid Shield that contains a high-tech protecting formulation to shield skin from environmental pollution, UVB and UVA rays. This innovative shield offers a dual protecting approach against the primary factors behind premature ageing, which includes a blend of star active ingredients with anti-UV and anti-pollution properties to defend against the harmful effects of everyday sun and polluted city or suburban environments.